TygerClaw Mid Back Bonded Leather Office Chair is very suitable for who need comfort when sitting in office or working station. This office chair comes with multiple functions which provide maximum support, ease and comfort to user. This chair is upholstered in soft and durable Bonded Leather material for better comfort. The seat height can be easily and effectively adjusted by pneumatic gas lift and 360 degree swivel wheels makes this chair more flexible in the working space. With the lumbar support of this chair, you can maintain your natural inward curvature of the lower spine for long working day. Style your home desk with the executive styled LOF-408-O office chair from CorLiving. Easy to care for Black leatherette with contoured lumbar support adds comfort and style to any home office. Features include foam padded tilting backrest, foam padded seat, armrests and rolling wheels. Ergonomic gas lift adjusts the seat to your body height and shape with ease. A great addition to any home! Style your office desk with this executive styled office chair. Easy to care for leatherette with contoured lumbar support adds comfort and style to any office. Features include foam padded tilting backrest, foam padded seat, armrests and rolling wheels. Ergonomic gas lift adjusts the seat to your body height and shape with ease. A great addition to any office! Style your home desk with the convenient LOF-312-O office chair from CorLiving featuring a black fabric seat, contoured lime green mesh back support, gas lift and black legs with rolling wheels. The comfortable, contemporary design will accent any desk setting while offering the option to adjust to your desk height and body shape with ease. A great addition to any home! 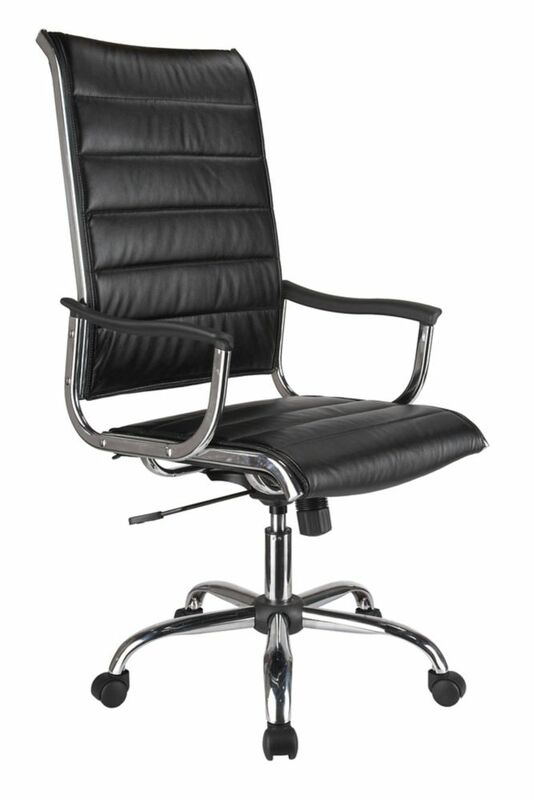 Bring comfort and style together with this modern high back leather-look executive office chair. BIFMA certified for home or commercial use, this elegant black executive chair is supremely cushioned and curved to support your back and head, accented with rounded sleek silver armrests. The thick swivel seat convenientlyadjusts to your desired height with a lever, along with a tilt back lock-in mechanism. The sturdy silver metal base with five capped nylon castors, smoothly glides across the floor for easy mobility. This easy to assemble trendy executive office chair gives a rich look to any office or gaming space. High Back Bonded Leather Office Chair TygerClaw Mid Back Bonded Leather Office Chair is very suitable for who need comfort when sitting in office or working station. This office chair comes with multiple functions which provide maximum support, ease and comfort to user. This chair is upholstered in soft and durable Bonded Leather material for better comfort. The seat height can be easily and effectively adjusted by pneumatic gas lift and 360 degree swivel wheels makes this chair more flexible in the working space. With the lumbar support of this chair, you can maintain your natural inward curvature of the lower spine for long working day.